Persil 3in1 capsules with powerful stain removal and colour care. Triple Action formula for brilliant stain removal, fabric care and freshness. Expert Persil colour 3in1 capsules keeps colours looking vibrant for longer. Double the stain removal power per drop. Easy-to-use 3in1 capsules with improved resealable packaging. Enough for up to 50 washes, perfect for families. Persil 3in1 Colour Capsules give great cleaning performance while helping to preserve bold colours and prints wash after wash. The Triple Action formula in these Persil laundry detergent pods gives you powerful stain removal and a fresh fragrance, all while caring for the colours and fibres in your clothes. These Persil 3in1 washing capsules will leave the whole family with fresh, clean clothes time and time again. You?ll find enough Persil capsules in this pack for up to 30 washes ? ideal for smaller households. 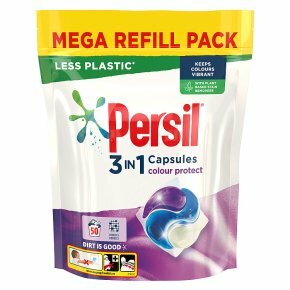 Persil 3in1 capsules: Efficiency, effectiveness and colour care Persil 3in1 capsules are the latest innovation in Persil washing capsules, created to give you powerful stain removal and expert clothing care in one convenient pre-measured dose. Persil 3in1 capsules dissolve fast to get to work quickly. With improved resealable packaging Persil colour washing capsules are designed with the whole family in mind. How to use Persil colour capsules Simply place 1-2 Persil colour capsules (depending on load size and water hardness) at the back of your washing machine drum before adding your clothes on top. For the best results, add Comfort fabric conditioner to the detergent drawer before washing as usual. Note: Do not rip, tear or pierce the capsules ? the outer layer will dissolve in the wash. VS. Our Semi Conc. Liquid.